Distinguished Toastmaster Mallika Sothinathan becomes the Toastmasters District 86 Public Relations Manager for the new Toastmaster Year. 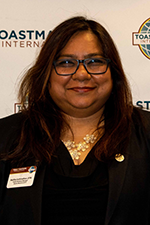 MISSISSAUGA, Ontario - July 6, 2018 - PRLog -- Toastmasters District 86 Director Kristina Johnston appointed Mississauga resident and Distinguished Toastmaster Mallika Sothinathan to serve as the district's Public Relations Manager for the 2018-2019 Toastmaster year. She will be responsible for leading the promotion of the Toastmasters Brand across South West, Central and Northern Ontario and will be the main contact person for establishing and maintaining communications between the district, the media and over 5000 Toastmasters. Sothinathan, a member of Atos Toastmasters, Speaking for Success Toastmasters Club and Great Minds Advanced Toastmasters Clubs in Mississauga joined Toastmasters in 2014. Prior to her public relations role, she was a club Vice President of Education (2014-2015), Area B 32 Director (2015-2016) and most recently the 2017 – 2018 Division C Director, supporting 28 clubs in the Mississauga area. Sothinathan's experience in producing corporate films, infomercials and documentaries will be a strong asset in her new role and her Toastmasters' journey. "My desire as a Distinguished Toastmaster is to improve the lives of people in our community by educating them about becoming better communicators and leaders", says Sothinathan. "My new role will help me achieve what I love doing most, reaching out to the community and making a difference". With the new appointment, Sothinathan will serve as a member of the District 86 Executive Committee, alongside Distinguished Toastmasters Kristina Johnston (District 86 Director), Jacklyn Payne (Program Quality Director), Jocelyne Vezina (Club Growth Director), Cathy Herschell (Immediate-Past District 86 Director), 10 Division Directors, 60 Area Directors, Committee Chairs and her Public Relations Team. For more information about Mallika Sothinathan, please contact the Public Relations Manager, Toastmasters District 86. District 86 is one of 106 districts in the world. It was formed in 2008, representing the heartland of Ontario and comprising of over 235 community and corporate clubs, with over 5,000 members, from Timmins in the north to Welland in the south, from Sarnia in the west to Markham in the east - and all communities in between - except Toronto. To learn more about District 86 please visit District 86 Toastmasters website (http://www.toastmasters86.org/). Toastmasters International is a worldwide non-profit educational organization that empowers individuals to become more effective communicators and leaders. Headquartered in Englewood, Colo., the organization's membership exceeds 352,000 in more than 16,400 clubs in 141 countries. Since 1924, Toastmasters International has helped people from diverse backgrounds become more confident speakers, communicators and leaders. For information about local Toastmasters clubs, please visit www.toastmasters.org. Follow @Toastmasters on Twitter.